SEC West // last week was an important game for the SEC East battle, this game is a different kind of important. Since Arkansas is in the SEC West, we can lose this game and still head to the SEC Championship game, but we need to win this game, because I want us to go to the playoffs, obviously. The first matchup between UGA and Arkansas was in 1969, and the record currently stands with Georgia leading 9-4. The teams haven't met since 2010 when Arkansas came to Athens and beat us 31-24. Hopefully there's still a bad taste in their mouth. a freshman! // with Todd Gurley possibly out for the rest of the season, we have shown our depth in the running back position. Georgia has always been an outstanding program for running backs, and this year is no different. Last week, true freshman Nick Chubb picked the team up and carried for a career high 143 yards and one TD. It rubs me the wrong way that the announcers called him "Baby Gurley" for the first quarter, but after they realized he was an outstanding athlete all on his own, they learned his name. Hopefully we'll get to see a lot more of Nick this weekend. while we're talking about Todd // there's not been an actual update on his status, I'm going to take a second to voice my opinion on this subject. The kid made a bad choice and put his team and career in jeopardy, but college is a time to make mistakes. When I was twenty, I made plenty of mistakes in Athens, not limited to a haircut, the guy I dated, and going to Bourbon Street. I think Coach Richt did the right thing by sitting him, because we all remember AJ Green's suspension [which by the way, everyone still felt the same way then.] I hope all of the media coverage is enough for the NCAA to realize there are certain rules they should change. If they're really hurtin' for that money, why don't they set up an approved system for the athletes to sign autographs and receive a kickback? Because, honestly, if it's true that he only got $20 an item, he got ripped off. That's all I have on that. Well unless I write up an argument against people saying "rules are rules" -- that would make a good list... Also, I'm just going to leave this here. wooo pig sooie! // The University of Arkansas is an SEC school, so obviously they have traditions too. 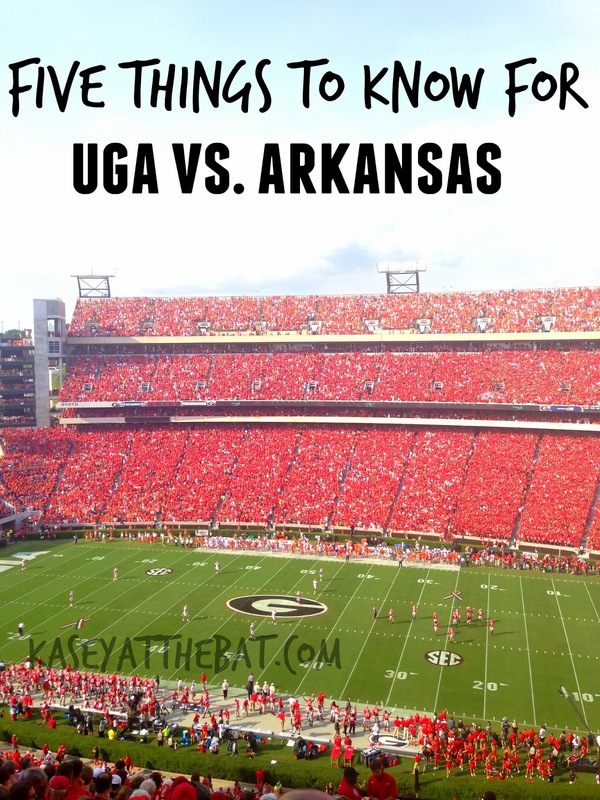 [I'm sure other schools have them, I'm just really not up to any of the other division school's traditions..] In Athens, we call the dawgs, well in Arkansas they call the hogs! I love a good chant. So if you hear someone shout "woo pig sooie!' on Saturday, they're not being rude or calling you fat, they're just cheering for Arkansas. all about that d // Arkansas really likes to run the ball, so does Georgia. This game will come down to which team's D-Line can stop the run game. Last week we forced poor Matty Mauk to throw four interceptions, so if the defense that went to Mizzou also goes to Arkansas, I'll only lose like, 4 years off of my life instead of 10. If the defense that showed up for Tennessee is there, I'll be closer to 15. So, if you're looking for me Saturday, I'll be wearing my lucky dress and stress drinking mimosas, hold the orange juice. So really, it'll just be champagne. I'm linking up with Sarah + Karli! What games are you looking forward to this weekend? Do you have a lucky gameday outfit, watching spot, or mixed drink? I'll actually probably catch a game or two this weekend. CRAZY, I know. stop the presses!! it should be a good football weekend! We watched that Mizzou game last weekend and we were getting annoyed with the announcers calling him "baby Gurley" too! It's like, geeze, the dude has his own name! I watched the game last week, but it was on mute since we were at a wedding reception. I didn't know about the "baby gurley" ridiculous! my step dad is a razorback fan so it should be interesting at my mom's house this weekend. ha! it made me so cranky! I also counted, they mentioned gurley 30 times in the first 3 minutes of the game. I love watching the game with the other team's fans! as long as everyone can be a good sport, it's so fun to have someone to go back + forth with! That cartoon made me a little bit too happy earlier this week. Go Dawgs! right? too accurate! go dawgs! !